The Isolation Room/Gallery Kit is an evolving project which consists of a ‘gallery kit’ or 7’ x 7’x 9’ box which can be readily constructed in any interior space. Isolation Room/Gallery Kit then forms a modular viewing space or gallery, complete with lighting rig, in which an individual art work can be shown. Originally conceived by Daniel McGrath and Dana Turkovic in St. Louis, America, in July 2010, Isolation Room/Gallery Kit allowed the artists to place a work of art into a state of quarantine, removed from any pre-existing themes or contextualization. Forcing both the viewer and the artwork into a confined space, the project encourages spectators to engage with the work on a purely aesthetic level and re-establishes the relationship between artists, curator and audience. Over three and half years, Isolation Room/Gallery Kit has been built and experienced in a variety of local, national and international venues such as: The Fabrikken, Copenhagen, Denmark; The Lemp Brewery, St. Louis; Hunter College Galleries, New York; The Luminary, St. Louis; and has exhibited works by Ed Ruscha, Marcel Dzama and Alison Jackson. Content below is from the Isolation Room / Gallery Kit​ web site's 2010-2013 archived pages. 5723 DEWEY AVE. 1ST FLOOR ST. Isolation Room/Gallery Kit is working on their triennial : JULY 2010-JULY 2013 catalog that celebrates 3 years of exhibitions and events. You have all heard the stern admonition from supervisors or lifestyle gurus that we must: “Think outside the box” to get on in work and in life. But of course we know boxes are infinitely useful. Sit on them individually as chairs, stack up a few boxes we have a table, open the tops and turn them on their side we have book shelves. As well as storing ordinary things, you can also use boxes as shelter, drawing surfaces, costumes and re-cut the cardboard into sculptures or vast stage sets: A child may even prefer the large box the toy came in to the plastic toy because the container allows the imagination to transport into other worlds. Instead of delivering a preprogrammed experience the carton becomes- in the hands of the child- an airplane, an army base or a ship. In the case of Isolation Room the box is the 7’ x 7’x 9’ Gallery Kit (2010) whic h occupies a dining room plus a carefully selected drawing, painting or sculpture. The kit can be built in any existing interior space at minimal cost ‘DIY’. It is just big enough to fit in a few visitors to contemplate the beauty within and includes its own track lighting system. The gallery kit re-imagines the ideal integration between art and life: as such it is also a perfect unregistered non-profit art space. As an owner the space is as public or private as desired and the hours are by appointment. As a visitor, if you tire of the interior of the gallery and the art, you can sit down outside in the living room and rest your feet. You can have a chat with the kit owner and have a glass of wine or watch TV shows- the discussions are always a highlight. Then you can wander off into the back garden and have a smoke if you like, which to be candid, is the reason you probably agreed to show up in the first place. It’s an ideal for living. Started in July 2010, Isolation Room is an evolving project that will focus on one artwork per exhibition cycle. Each piece will be placed in a physical state of quarantine, situated in a modular viewing space inviting an extended period of contemplation. Building on an ongoing interest in containment, the constructed room allows for the smallest possible collaboration between the gallery space, curator, artist and audience. At its core one work stands in isolation. This is also an opportunity to protect work from a forced theme, loose contextualization or commercial exploitation. By placing the individual piece as a subject in isolation the work is then encouraged to exist and be perceived from an aesthetic standpoint. Daniel McGrath is an adjunct professor in the art department at Webster University in St. Louis. In 2005, he received his Master of Arts from Kings College – University of London. In 2000, he earned his Bachelor of Fine Arts from UCLA. He is co-director of Isolation Room/Gallery Kit, was co-director of Sweetboy Projects in Los Angeles and has organized exhibitions in St. Louis and the United Kingdom. He is a contributing art writer for Art US, Review Magazine and St. Louis Magazine. He has published essays on the work of Korean artist Fi Jae Lee, local painter Jaime Adams, and book reviews for the Imperial War Museum in London. He has exhibited his work at Hunter College MFA Studios, New York; Office Space, Los Angeles; SweetboyProjects, Los Angeles; Pirate, Burford, UK; PSTL, St. Louis; and the Hunt Gallery, St. Louis. He lives and works between Oxford, United Kingdom and St. Louis, Missouri. Dana Turkovic is Curator of Exhibitions at Laumeier Sculpture Park. She is also an adjunct professor in the art department at Webster University. In 2005, she received her Master of Arts from Goldsmiths College – University of London in curatorial studies. Though she spent many years as the senior designer for the UCLA Hammer Museum, she has turned her attention to creative curatorial endeavors. She has organized exhibitions in Los Angeles at Monte Vista Projects in alternative spaces in London and Oxford in the United Kingdom and in St. Louis at the Contemporary Art Museum, Boots Contemporary Art Space, Ellen Curlee Gallery, White Flag Projects and Schmidt Contemporary Art. She has written for publications such as Art US and Review Magazine. She lives and works in St. Louis, Missouri. 1. Measure out an area in your house or apartment that can accommodate a 7x7-foot cube with an entryway on one side and anticipate a 10-foot-high clearance on top. For floor: Place four 84-inch 2x4s with a 45-degree miter cut (the 45-degree cuts only need to be cut on these four pieces to ensure a right angled base) in a square shape on the ground, corner to corner. Place small off-cut pieces of 2x4 in each corner to reinforce; then glue and clamp. Pre-drill 8 holes through the frame into the corner reinforcements, then countersink the predrilled holes and screw in 3-inch drywall screws. Place two 80-inch 2x4s in the center of the frame and pre-drill 8 holes into the ends the 80-inch 2x4s. Countersink each hole and then screw in 3-inch screws. 2. Take two 38-inch 2x4s and place them perpendicular in the center of the frame. Through the outer frame, pre-drill 4 holes into the ends of the 38-inch 2x4s; countersink and then screw in four 3-inch screws. On both sides, at the joint between the 38-inch and 80-inch 2x4s, pre-drill at a 45 degree angle into the 80-inch 2x4s through the 38-inch 2x4s. Then countersink those holes. Screw in 2-inch screws to complete the framework for the base of the Gallery Kit. 4. Once the base is satisfactorily squared up, pay particular attention that the edge between the two MDF panels is as close and flush as possible. Then at equidistant lengths, pre-drill through the MDF into the substructure of the 2x4 frame, taking care not the move the panels or frame as you are doing this. About three screws should be used on the 42-inch sides and four screws on the 90-inch inch sides of each panel. Then countersink each drill hole and begin drilling in 2-inch screws. Step on the floor base to see if it will hold you. 6. For Side #3: Lay out two 76-inch 2x4s. Join them with four 87-inch 2x4s with two 87-inchers placed in the center (the 38-inch mark of the 76-inch 2x4s). Repeat Step 5, and then repeat Step 4 to attach the 90x38-inch MDF to this panel. For the Side 2# doorway panel, lay out one 42-inch 2x4 and one 76-inch 2x4. Between these place two 87-inch 2x4s to form a rectangle. It will form a rectangle with a remainder of 34 inches of the 76-inch 2x4 protruding. Place two 8-inch 2x4s (one next to the 87-incher and one at the end of the 76-incher). Form a door lintel with the 34-incher laid at the base of the 8-inch 2x4s. Repeat steps 5 and Step 4 by screwing MDF (42x90 and 34x 12) onto the doorframe you have built. Again, insure the base edge is flush between 2x4 and MDF. It will be easier to stand when assembled! 11. At this stage the roof of the Gallery Kit should be made. This consists of two sheets of ¼-inch plywood 90x42 inches and reinforced with a strip of 90-inch 2x4 on the exterior. The 2x4 prevents bowing and provides a support for light fixtures. The lighter plywood ensures the roof is light enough to lift for one or two people. At edge of the plywood, use four 1-inch screws to join the plywood and one 90-inch 2x4. Countersink so the screw heads don’t show after painting. Note: The preceding information is based on a re-creation of our own step by step construction process. Feel free to adjust to your own skill level and needs. Having seen the Isolation Room/Gallery Kit worked, some entrepreneurs have discussed the idea that perhaps the kit could be re-purposed to be used by online ecommerce sites and even a retail store in a mall as a free standing presentation pod. Let's say you have an online eyeglasses frame store but you want to have a presence at a mall without the huge over head of having an actual store space. The Isolation Room/Gallery Kit could be created in the mall to present, let's say round glasses from your ecommerce site: Eyeglasses.com. Visitors to the mall, seeing the presentation would then be able to connect to the website via a computer that is part of the Isolation Room kit, in this case the Eyeglasses.com frame ecommerce site, and order the frames. This particular store in the above link has two actual stores in Connecticut. However having a Isolation Room/Gallery Kit standing in a mall in a different location the state or even in another state where a customer could order eye glass frames would give Eyeglasses.com a greater presence and reach more potential customers. It's a thought to keep in mind. Isolation Room/Gallery Kit is pleased to announce a June exhibition with work by New York based artist Pablo Helguera. The works chosen for Isolation Room are carefully selected, casual looking pen drawings taken from ‘Artoons’. (For all you literary snobs and New Yorkophiles out there, they display an uncanny resemblance to New Yorker magazine cartoons.) ‘Artoons’ capture the alien yet alluring art scene by holding up a mirror to some of the most absurd art world characters including: the overbearing curator, pretentious theorist, money grubbing gallerist, failed artist, pathetic wannabe, ignorant expert and last but not least the beloved but clueless ‘gallerina’. In contemplating the snarky offerings here at Isolation Room, we are first reminded of the elegant 19th century French caricaturist Honore Daumier, but afterward infected by the poisonous venom also found in Ad Reinhardt’s biting cartoons. Yeah, they are that GOOD. The Artoons represent harsh truths about the attitudes of a world he knows all too well. Because Helguera is a prolific award winning artist and his installation, sculpture, photography, drawing, and performance projects are currently the art world’s best kept secret it is even more fun to see him ‘bite the hand that feeds’ in these witty drawings. Artist biography: Pablo Helguera has exhibited and/or performed at venues such as the Museum of Modern Art/Gramercy Theater, Museo de Arte Reina Sofia, Madrid; ICA Boston; RCA London; 8th Havana Biennal, PERFORMA 05, Havana; Shedhalle, Zurich; MoMA P.S.1, New York; Brooklyn Museum; IFA Galerie, Bonn; Tokyo Metropolitan Art Museum, Tokyo; MALBA museum in Buenos Aires, Ex-Teresa Espacio Alternativo in Mexico City, The Bronx Museum, Artist Space, and Sculpture Center, amongst many others. His work has been reviewed in Art in America, Artforum, The New York Times, ArtNews, amongst others. In 2008 he was awarded the John Simon Guggenheim Fellowship and also was the recipient of a 2005 Creative Capital Grant. In 2011 he was named winner of the International Award of Participatory Art of the Region Emilia-Romagna in Italy. Since 2007, he has been working as Director of Adult and Academic programs at the Museum of Modern Art, New York. He has organized close to 1000 public events in conjunction with nearly 100 exhibitions. In 2010 he was appointed pedagogical curator of the 8th Mercosul Biennial in Porto Alegre, Brazil, to take place in September 2011. It is Summer again so hit the garden and enjoy the photosynthesis. Perhaps the more advanced horticultural practitioners among you will also grow your own food or even develop new breeds of flowers and plants. Sarrita Hunn and Ryan Thayer are doing something just like that with their synthesis of biology and photography. Long before the now notorious GM “Frankenfood” of Monsanto Corp, came the benign agricultural practice of grafting plant stems. Separate species of plants spliced together to keep samples alive for later replanting. In the virgin soil of this collaboration between Hunn and Thayer, Isolation Room/Gallery Kit will host a grafted plant sculpture made with a collaboratively built pot base and macramé weaved hanger that resembles the helix of DNA. The duo’s interest lies in the formal qualities of grafted plants as a metaphor for photography (light drawings). A photograph captures a vanished moment in time, but is also experienced in the present tense, with the promise that the image has a future. Plant grafting preserves genetic legacies from the past that are designed to re-germinate the future. Here, all these associations are condensed into a handcrafted object. Sarrita Hunn is a painting-based interdisciplinary artist whose practice includes writing, arts administration, teaching and curating. She received a BA in Studio Art, Art History and Philosophy from Drury University in 2001, a MFA in Fine Arts from California College of the Arts in 2004 and attended Skowhegan School of Painting and Sculpture in 2006. Her work has been exhibited nationally over the past decade at such venues as Laumeier Sculpture Park (St. Louis, MO) and Yerba Buena Center for the Arts (San Francisco, CA), and with artist-run spaces and projects across the globe including Andrea Zittel’s A-Z West (Joshua Tree, CA), Spor Klübü (Berlin, Germany) and recently with Koh-i-noor (DK) at Malmö Konsthall (Sweden). In 2012, she was awarded a Danish International Visiting Artists Exchange Program (DIVA) grant by the Danish Arts Council and in August will participate in “Decompression Gathering Summer Camp,” a summer residency and workshop organized by Corniolo Art Platform and Radical Intention near Florence, Italy. Sarrita is the Residency Program Director at The Luminary Center for the Arts and co-founded Temporary Art Review with James McAnally in 2011. Together they have worked with more than 80 writers and contributing editors to published over 280 profiles, reviews, interviews and essays that focus on alternative spaces and critical exchange across the United States. Ryan Thayer is an artist based in Berlin making conceptually driven photography and large-scale sculptures. He holds a BA in Studio Art and Art History from Drury University and a MFA in Photography from California College of the Arts, San Francisco. His work has been exhibited in the US and Europe including solo exhibitions at Koh-i-noor, Copenhagen, Denmark and NOMA Gallery, San Francisco, CA; and in group exhibitions at Galleri Box, Gothenburg, Sweden; Southern Exposure, San Francisco, CA; Arthouse, Austin, TX; among others. 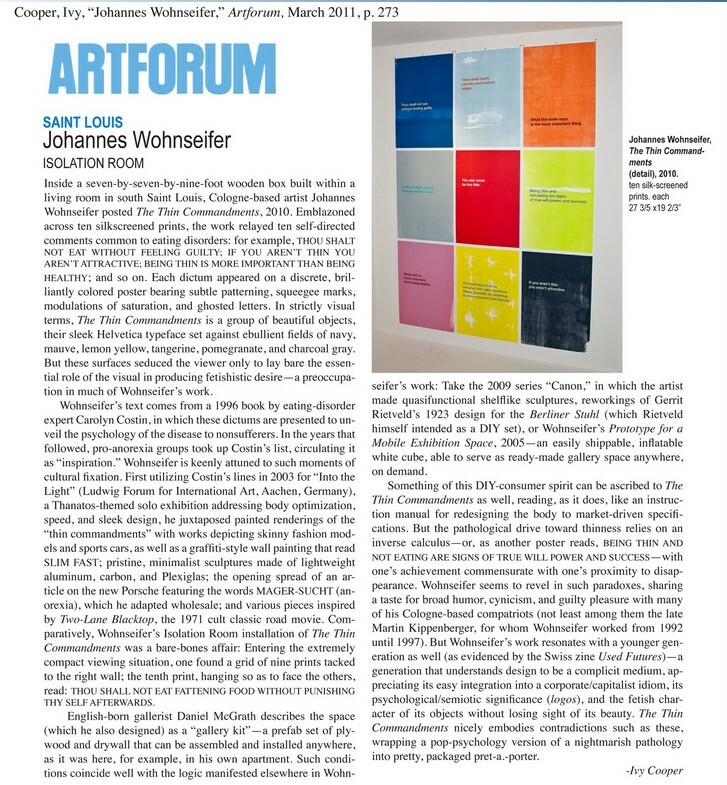 Thayer’s artwork and exhibitions have been written about in a variety of publications including Artforum.com, Information (DK), Politiken (DK), SLEEK (DE), Paletten (SE), Artweek, Houston Chronicle, Riverfront Times and the Saint Louis Beacon (US). His recent awards include a Danish Arts Council International Visual Artist-in-residency grant and a studio residency at the National Workshop for the Arts in Copenhagen, Denmark. Kim Seymour received her BFA from Oxford Brookes University in 2012. Her work has been exhibited at Oxford Museum's Gallery Room and Oxford Brookes University. She lives and works in Oxford, United Kingdom.